Do you feel lifeless or tired easily? Do you have shortness of breath or headache? Do you feel weak, dizzy or irritable? Do you lack concentration in your work? If the answer is yes to any of these, then chances are that you have iron deficiency anaemia. Which means your body does not have sufficient iron. In a symposium on iron deficiency anaemia, organised by Kellogg India and Indian Dietetic Association, Bangalore Chapter, held recently in Bangalore, Dr Subhadra Sheshadri from M.S. University, Baroda, revealed that about 60 per cent of young children in India are anaemic. In a study undertaken on upper income group college girls in Baroda, it was found that 50 per cent of them were anaemic. Prevalence of anaemia is higher in females than in males. About 80 per cent of the anaemia is due to iron deficiency and the rest, is due to folic acid and vitamin B12 deficiency, said Ms Mary Mammen from Christian Medical Hospital, Vellore. Iron is largely present in red blood cells as hemoglobin. Carrying oxygen to every cell is the most important function of iron. You are more likely to be iron deficient if: a) you are pregnant and not eating enough iron rich foods; b) you are a woman who could be menstruating, skipping meals or not eating enough; c) you are a teenager who is rapidly growing and reached puberty or; d) you are a child who is a problem eater. Dr Sheshadri said that activity, efficiency, memory, appetite and sense of well-being are lower in anaemic children than in normal children. Absenteeism from work is more common in anaemics. Chances of premature delivery and low birth weight babies are higher if pregnant mothers are anaemic. Appropriate dietary intake is the permanent solution to iron deficiency anaemia, according to Dr Kalyan Bagchi of Nutrition Syndicate. Since the body does not produce iron, it must be obtained from food. There are two types: i) non haem iron - found in cereals, green leafy vegetables, dals, nuts and eggs and ii) haem iron - found in red meat, fish and poultry and is more easily absorbed. Eating iron-rich foods is not enough to maintain the iron levels in the body. Making sure that they are properly absorbed into the system is important, because, there are some inhibitors that decrease iron absorption. They are: a) drinking tea with a meal, b) presence of phytic acid and fibre in bran of cereals, c) taking a calcium: phosphate supplement with a meal and d) phosphvitin present in egg. The solution to this problem is to take vitamin C rich foods. Eating sprouts, fruits like guava, gooseberry, lime, orange, musambi, etc will help in good absorption of iron into the body. The following hemoglobin levels are considered normal for different groups: Children below six years and pregnant women - 11 g/dl; Children between six to eight years and women of reproductive age - 12 g/dl; Adult males - 13 g/dl. 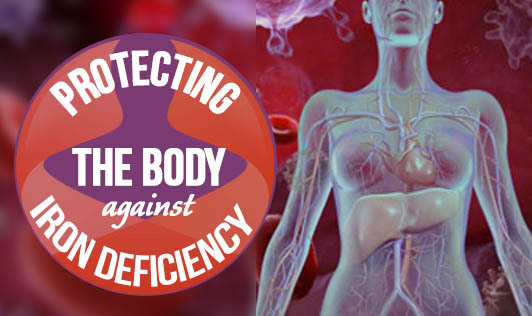 If you eat foods keeping nutrition in mind, iron deficiency anaemia will become less prevalent particularly amongst those people who have enough to eat but do not know what to eat.